Table Set: Checking into carnival glass auctions over a five-year period reveals no sale of complete sets. On one occasion a butter dish sold for $275. 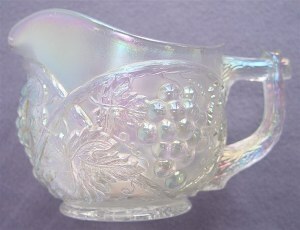 A creamer sold at another time for $215. Another sale offered a creamer and spooner which sold for $215. A spooner sold by itself brought $230. These pieces were all in white and we have not way of knowing whether some damage influenced bidding. No honey amber examples were offered. We do know of a complete set which sold for $900, while another set was offered for sale in a room at convention for $1050. Considering entry into the arena in the 1909 timeframe, we can believe that many sets were actually used on dinner tables of the era, separated by breakage, making them difficult to complete as a set today. PALM BEACH - Pitcher is 7 in. tall with a 5 in. base diameter. Water Set: This seems to be another scarce commodity in today’s world. 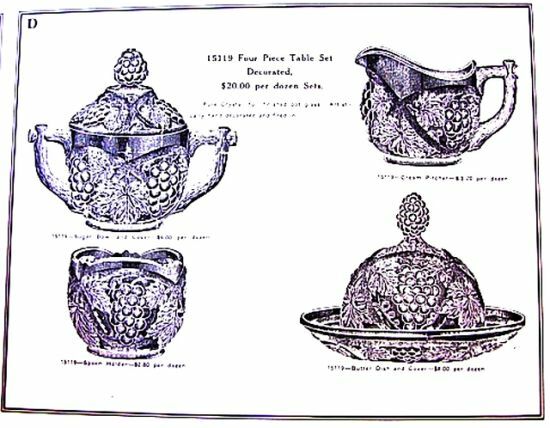 Marketed in Honey Amber, marigold and white, as was the case with most Palm Beach shapes, we have always marveled at the lovely off-white, or lavender appearance of many examples within this pattern. 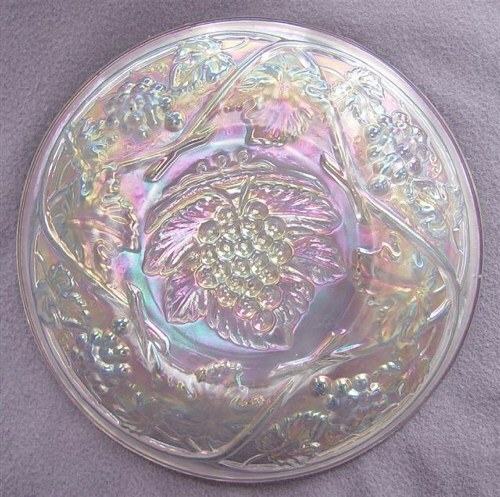 They certainly are frosty and accept the iridescence beautifully, but that lavender effect is totally different from all other manufacturers of white carnival glass. $500. is a good round figure for a 7 pc. water set. 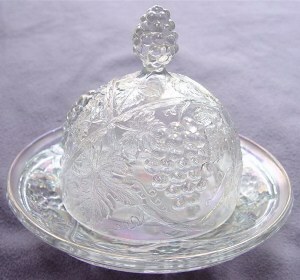 Butter Dish Base: Our feeling that the overall beauty of both Palm Beach and Cosmos and Cane are not given their “due” by many collectors, has led us to insert this picture of the extent to which U.S. Glass went, in order to extend their wares into classic artwork. Great respect is due those artisans who created the moulds in designs surrounding nature close at hand. 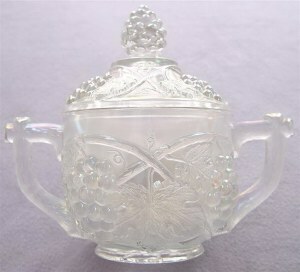 When earlier molds used in production of pressed glass were carried over for use in iridized glass, more detail is noted in the design. Many of the pattern molds developed specifically for manufacture of our carnival glass, lack the overall design quality found in Palm Beach. 4 in. 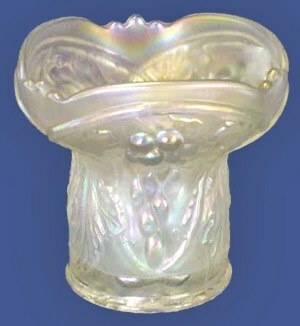 PALM BEACH vase in Amethyst - Goofus Treatment. 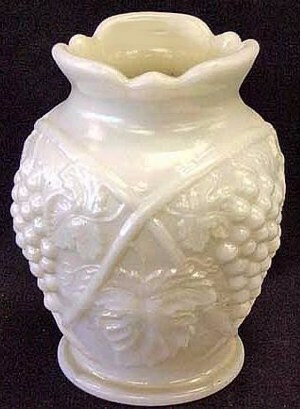 PALM BEACH Whimsey Vase, from Spooner - 4 in. tall. 6 in. tall. 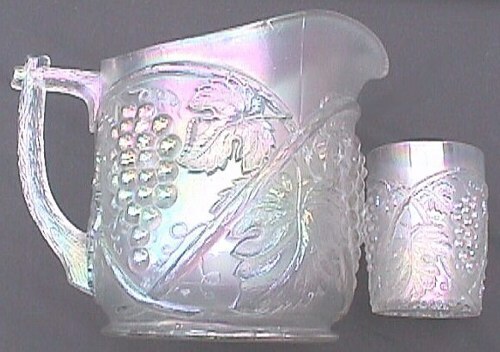 Iridized-Pearlized PALM BEACH Vase.Opaque, such as on milk or custard base glass.Sold for $800. 5-28-05 Wroda Auction. Spooner Whimsies: Great stretches or “swings” were afforded the spooners chosen for this “extremity”! Artful outcome and imagination produced very desirable shapes for those collectors of the unusual. 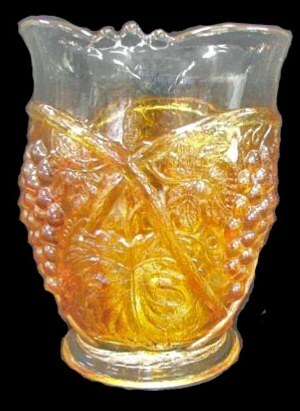 Re: the marigold vase with clear glass top? Such curious finishing technique would be quite interesting to watch. We have never seen another example such as this. 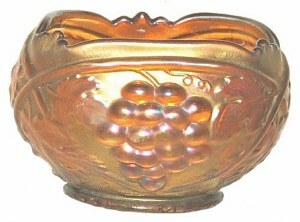 PALM BEACH Rosebowl - 4 in. tall in Marigold. Marigold PALM BEACH 7 in. bowl with four sides pinched. 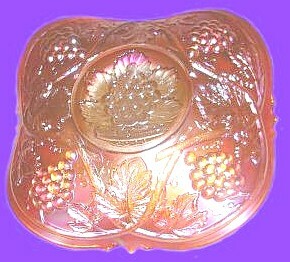 Sauce-flared: This flared piece derives from the 5” sauce which accompanies the larger master berry bowl. During the five year auction period researched, only ONE complete 7 pc. berry set sold. It was in white and sold for $375. Banana boat shapes and 7” plates in various colors are also to be found in the Palm Beach pattern. 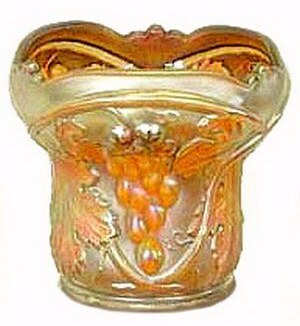 All producers in the circle of “BIG FIVE” carnival glass manufacturers prided themselves on patterns centered around “grapes and vines”. 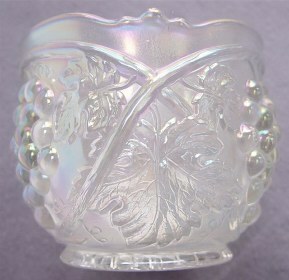 We hasten to note that none of them surpass the “elegance” put forth by U.S. Glass in marketing the Palm Beach design. Abraham and Sarah gave birth to a child in their old age. That one child, Isaac, had two sons (Esau and Jacob). God’s creative power brought forth the miracle of Israel, and ultimately the Savior, Jesus Christ.